Filed to: patsy walker aka hellcat!Filed to: patsy walker aka hellcat! 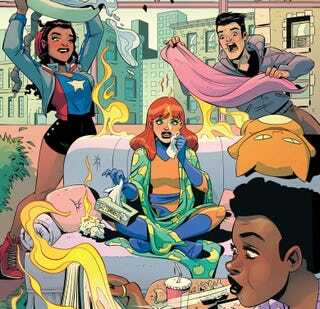 Patsy Walker, A.K.A. Hellcat! is one of those books that you think is going to be too cutesy, but ends up actually being just the right about of cute and funny and awesome. It’s written by Kate Leth, with art by Brittney Williams (who also draws the amazing Goldie Vance comic). The last issue dealt with the fact that Patsy has a cold. But since she has a magical sixth sense (or perhaps this is a magical cold), every time she sneezes weird things happen. Yes, her sneeze did change their clothes to classic Luke Cage and Valkyrie — probably because she misses being in the Defenders, y’all. In any case, Patsy decides that enough is enough and goes to confront Mister Sniffles head on. It’s okay, Patsy, I’m afraid of The Babadook, too. And also everything else you said. Ms America is wearing a maple leaf because Patsy sneezed on her. And that’s why Patsy Walker, A.K.A. Hellcat! is a goddamn delight. Is this metal confusion that I currently feel? Is the sacred stranger scared or the scared stranger stronger? This mental confusion must go on no longer! Your proofreading boycott is causing great danger! Such misunderstanding is making me tearful! Proofreading’s important to avoid mental harm!